Wow! Wow! Wow! Is all I can say…….Eddie is amazing and a true perfectionist at his work………………..Everyone on my wedding day commented on my teeth and I have referred them all to you Eddie. It is an incredible job and I simply cannot thank you enough ever! BA, B. Dent. SC. (Hons) T.C.D. "Hello, my name is Eddie Goggins and I am the founder and clinical director of Dublin 18 Dental Rooms. (Formerly known as Cabinteely Dental Care) I love dentistry and I am a perfectionist by nature and I strive to be the best at everything that I do. My vision has always been to create the best dental practice in Ireland but not just a place of clinical excellence, but a place which has a happy friendly culture. I love where I work because I have gathered a group of like-minded individuals that share my vision. We all believe in providing the best dental care possible while ensuring it is an enjoyable experience for our patients. I opened this practice in 2000 and every year it has improved and grown. Constant reinvestment in acquiring the latest technology and constant CPD training means that we can offer you the highest standards in modern dentistry"
Eddie qualified with first class honours from Trinity College Dublin in 1991. He began his professional career in the UK working in general dental practice with a special interest in restorative and cosmetic dentistry, and has gone on to develop a wealth of skills and experience. He is committed to ongoing training and professional development, and has gained certification from the University of Warwick on the four-year MSc Masters in Dental Implantology and is an ongoing member of the International Team for Implantology. Additionally he attended the Royal College of Surgeons in London for orthodontic training. Eddie is a member of the British Academy of Aesthetic Dentistry and additionally he has studied at the Bob Khanna Training Institute in facial rejuvenation, anti-wrinkle injections and non-surgical cosmetic procedures. 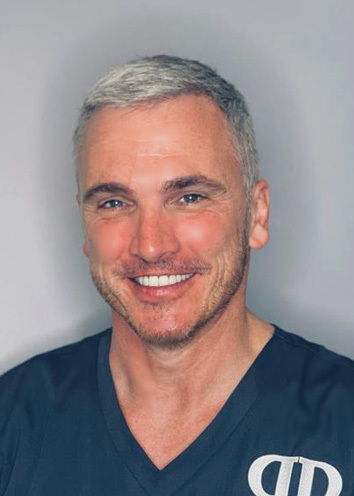 Eddie is a member of the Irish society of digital restorative dentistry and remains one of a small number clinicians in Ireland who offer digital CEREC restorations and "Crowns in a Day." He also has trained in the latest short term adult orthodontic procedures and is certified in provision of Six Month Smiles, Invisible aligners and Inman Aligner dental-treatments-dublin. Eddie has transformed the smiles and lives of many patients. When not striving for perfection in the dental practice, Eddie is striving for perfection in the sky. He is an avid aviator and has represented Ireland at the World Aerobatic Championships winning bronze. He shares this passion by teaching people to fly on weekends.